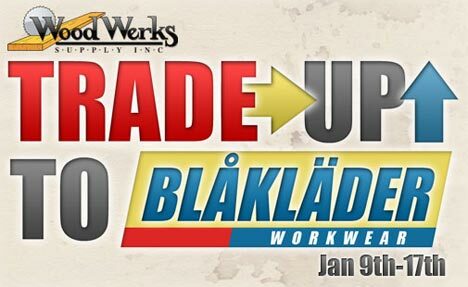 The Wood Werks store and Blaklader Workwear have teamed up to offer a killer Blaklader Toughguy Pants trade up program. From Jan 9th to the 17th you can get up to two pairs of Blaklader Toughguy pants for only $20 each. The regular price for these pants are $54.99, so this is a huge savings. Of course with prices this low, there is a catch. For every pair of pants you buy, Wood Werks asks that you donate a pair to your local Goodwill or shelter. The donation is a pretty simple thing to ask for such a great deal, so why not donate more then just two pairs of pants. Oh and don't forget to buy some knee pads. Thanks for such a great deal Wood Werks & Blaklader.